I wish to commend fellow journalist Bonnie Henderson on her heartfelt tribute to our former professor, Glen Love (Spring 2017). Glen was my undergraduate advisor during the same decade (’70s) he was formulating what would be a revolutionary movement in American letters, ecocriticism. He was always dedicated as a mentor, then friend, and we have never lost touch. I attribute the success of my own career as a journalist of environmental sciences largely to Glen, who never wavered in his support, encouragement, and interest in my career. I sincerely doubt I would have pursued that career track if it weren’t for Glen’s early inspiration. One of Glen’s many talents not mentioned is his active participation in music performance, which also contributed to production of Mason Williams’s album Of Time and Rivers Flowing, recorded in Eugene, with Glen a coproducer. The gift Glen made to me of a copy of the original vinyl LP occupies a place of honor in my music and literature collections. It was the early 1970s and the classrooms had, in addition to the typical student body mix, a number of Vietnam War veterans just back from defending our freedom and that of the South Vietnamese population abroad. 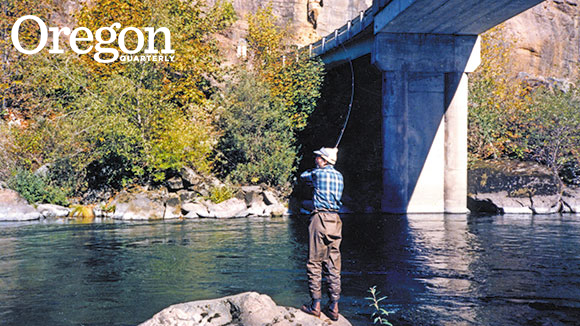 At the time I was consumed by my own life—graduate studies, three children and a husband, and making a 160-mile round trip from Roseburg to campus several times a week—and I was guilty of taking “freedom” for granted. I knew that it guaranteed my rights, but had never considered any responsibility that came with it. One day, that changed. My economics professor had just started his lecture when the classroom doors suddenly flung open. In charged a stream of scruffy malcontents—their bus identified them as protesters from UC Berkeley—shouting obscenities, throwing things, and creating absolute havoc. Their self-serving chaos was short-lived. All the veterans in the class stood up, as if by unspoken command, and confronted the disrupters. One by one—in a forceful yet nonviolent way—they removed the trespassers from our classroom and into the custody of the campus police. As the vets returned to our classroom, we greeted them with thundering applause, hugs, and shouts of thanks. We were all moved by what we had witnessed. Without hesitation, these young men had stood up for our rights as students, for their rights as students, and for the freedom that belonged to us on that day. Since that day I have never taken freedom, particularly the responsibility we all have to uphold it, for granted. It was such a treat to read “Purple State” (Winter 2016) about Barbara Mossberg, my favorite professor from my UO undergrad years as a journalism major. Even more fun was to see the picture, on page 24, of her students absorbing her enthusiastic passion. 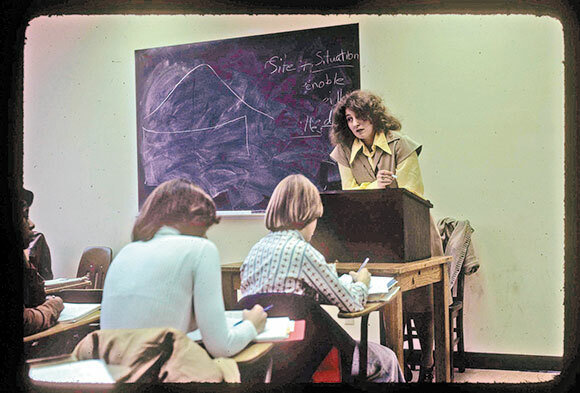 I was one of the students pictured, 20 years old in 1977, sporting my Farrah Fawcett hairstyle, which I’d recently updated from my long straight Cher style. (If you’re a woman, you’ll understand marking eras based on hair fashion.) How lucky am I to once again cross paths with my beloved professor, a fellow traveler, our lives doubling back and intersecting on the topic of John Muir in the Insight Seminar presented by UO’s academic extension. For although my Oregon ancestry runs deep, I spent several years in the Bay Area. That is when I first heard about John Muir and all he did to promote the protection of what are now our national parks. I really enjoyed having my passion for life reignited by the dancing campfire flames of Barbara’s heart. Perhaps if I’d grown up in Yosemite, baptized in the beauty, in the cradle of John Muir, I’d be more like her. If we all had, maybe we wouldn’t be continuously struggling to protect the natural cathedrals Mother Earth has lent to us from the ravages of greed. Thank you sweet “B” for all the love! I praise the Reset the Code project (Spring 2017), but we will always have rude and ignorant people, and because we have freedom of speech, some of their words will be in bad taste. Many of us are joyful about the election results. Can you accept a different opinion or will you crawl into your “safe space”? Perhaps this project will remind us all to treat everyone with kindness even if they have a difference of opinion. Let’s get to the point. What made learning come alive? Sitting in my first studio of architecture realizing “I don’t know squat!” and allowing myself to become Silly Putty in the great professors’ hands. I was a sponge and I got soaked good!